Capitalizing on her longstanding passion for homes and home design, Tundi is pleased to serve our local market as a realtor. With her marketing background, experience buying and selling property and solid work ethic, Tundi evaluates every option and pays attention to the details so her clients don’t have to. She is committed to helping her clients make smart, informed decisions, making the buying and selling process smooth, stress-free and successful. 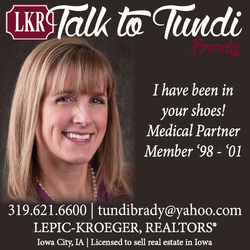 As a former member of Iowa Medical Partners, Tundi also understands the lives of residents and their families, and the specific challenges that come with buying and selling homes during residency. As part of the Johnson County community since 1998, Tundi contributes her extra energy to the schools, March of Dimes and to the University of Iowa Children’s Hospital as she and her husband raise four children. She is happy to provide free, no-obligation comparative market analysis. If you, or someone you know, need a realtor, talk to Tundi today. You will be happy you did.